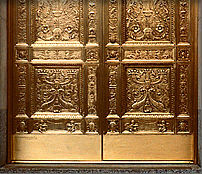 It's easy to find G.J.Nikolas Co. coatings protecting high profile metal surfaces throughout the United States. Banks, hotels, opera houses, theaters, historic buildings, cruise ships, statues, monuments, mausoleums and museums all depend on our coatings to maintain and enhance the metal surfaces on their buildings. Lincoln's tomb, the Smith-sonian Air & Space Museum, various state capitals and the Lyric Opera House are just a few examples of structures employing our coatings.